The ALUMINUM EDSS Wedge Rails - are wedge shaped parts that attach to the branches of a shoe. The stabilizing peg and attachment hole are used to fasten the Rails to the pre-drilled EDSS Shoes. There are 3 different elevations available, and they fit all sizes of EDSS shoes. Just like the frog inserts, elevation adjustments can be made without removing the shoe. The rails are most beneficial for adjusting the tension on the deep digital flexor tendon. The placement of the rails will also allow the horse easier medial and lateral leverage reduction, which will make turning much less painful for cases of laminitis and ring bone. EDSS Wedge Rails are available in both Urethane (Plastic) or Aluminum. Plastic Rails are sold in Full Sets, meaning a pair of all 3 sizes (12 pieces). 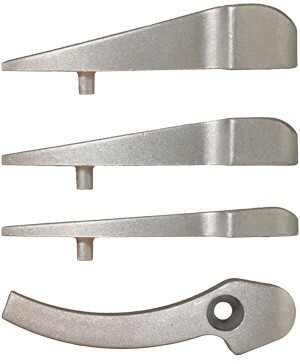 Aluminum Rails are sold in Pairs of individual sizes (4 pieces). *This product has been patented by Gene Ovnicek in U.S. Patent No. 5,727,633.